Cockroaches are nocturnal creatures that love dark, warm, moist hiding places in cracks, crevices, or hard-to-reach corners. They can infest everything from homes to restaurants to ships and planes. They will follow water pipes and electrical lines through walls from one room to another and even from one apartment to another. Most cockroach species invade from the outside or from sewers or drains. Cockroaches can contaminate food and surfaces, destroy fabric and paper, transmit disease, cause allergies, and leave foul odors behind. Cockroaches are nocturnal creatures that love dark, warm, moist hiding places in cracks, crevices, or hard-to-reach corners. Most cockroaches prefer to rest on wood or cardboard boxes rather than on metal and other surfaces. A roach infestation is not always a sign of dirty and/or unsanitary living conditions. They are notorious for hitchhiking in potted plants, bags, briefcases, packages, etc. If you’ve found a roach in your home, chances are, there are more than one. Cockroaches are social creatures, and roaches may have communicated to others as to which location in your house is the best for finding food scraps. Certain conditions, such as clutter, make it easier for roaches to survive and propagate in a home. 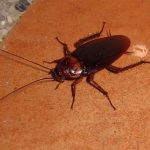 Cockroaches spotted in clean homes are far less likely to be part of a sizable infestation than roaches in a cluttered, dirty environment. Roaches are attracted to paper, including paper bags, newspapers and cardboard, as they use paper as a way to communicate with other cockroaches. Roaches are also attracted to food or even tiny bits of food remnants left out in the open, as well as any drops of water or condensation.